I have been always a dull and boring person - just ask my sons! When they were teenagers and wanted to go to some juicy horror movie I would not go. Understand, in the Czech Republic for certain movies, parents were required to accompany minors, so when I did not go, it meant they did not go also. Adding insult to injury, I told them, “Read the Bible instead!” And I meant it and I still do! If you desire vivid nightmares you don't need any horror movies, read the Bible! The Fourth Book of Moses, the book of Numbers, for instance, has an ample supply of such material. 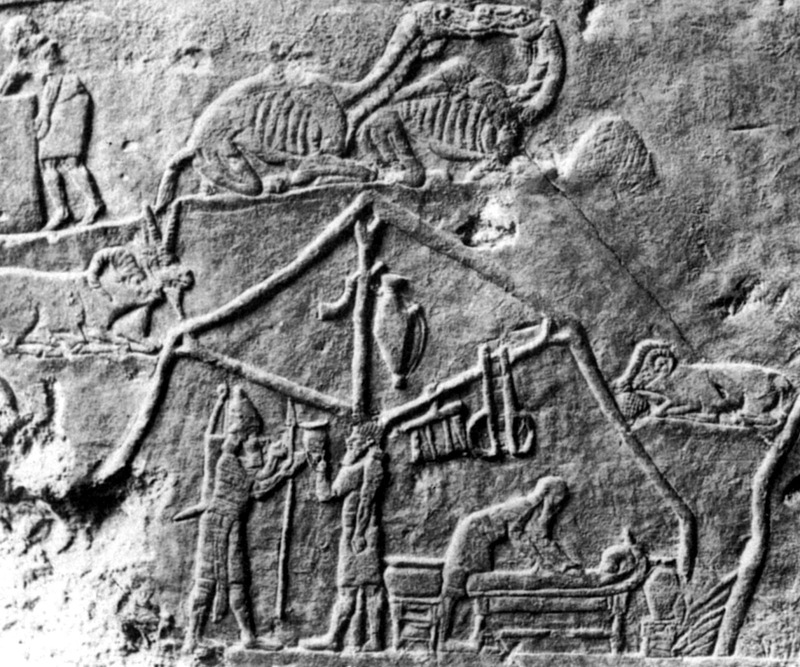 One such story, etched into my mind, is the story of the Korahite rebellion (Numbers 16). The final version of this story, as preserved in the Bible, is clearly a result of several editorial stages. The core of the nightmare is the oldest part, in which Dathan and Abiram challenged Moses’ leadership. Moses “piously” prayed for a divine sign and it immediately followed: Earth (in the story she is personified) opened her mouth and swallowed the rebels with their families and with all their possessions; they descended alive to Hell (Scheol) and Earth closed its mouth over them. (Thankfully, we are spared details how she burped afterwards!) I do not know about you, but being swallowed alive by (Mother) Earth can wake me up in the middle of night screaming, kicking and covered in cold sweat. After all, aren’t nightmares and dark myths made of the same subconscious stuff Mr. Jung? Every good myth and any real nightmare must contain at least some kernel of reality. Almost on the opposite side of Earth from the biblical Middle East I came across a surprisingly similar story. Early in the historic times (the end of the XVIII century), shortly after the first contact with Europeans, King Kamehameha I unified the entire Hawaiian archipelago. It did not happen peacefully. On Big Island one local chief named Keōua presented substantial resistance. 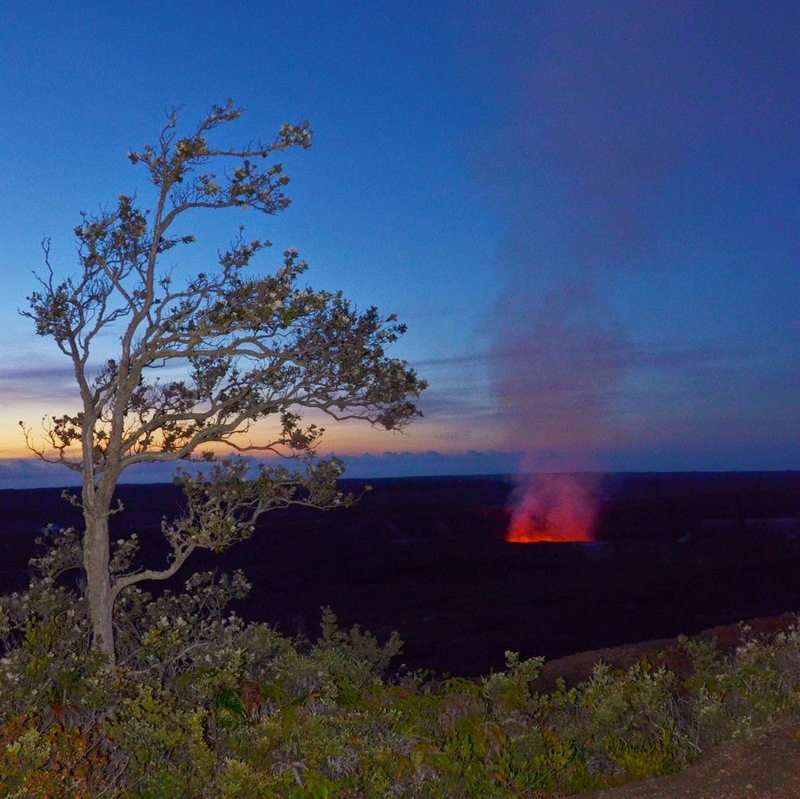 Non-violent eruption at the summit of Kilauea Volcano. In 1790 after yet another indecisive battle near Hilo, Keōua was returning to his home base on the other side of the island. He took his warriors and their families (Hawaiians, just like Israelites, were moving with their families) by way of the Kilauea Volcano. They camped at the summit caldera and since the volcano seemed restless, they wanted to appease the goddess Pele, Hawaiian goddess of volcanoes, by presenting some gifts. It did not seem to help; the volcano was getting more and more active and thus they decided to continue their journey home. Keōua divided his people into three groups. The first group left the summit under a dark volcanic cloud. The second group left the summit while the situation was getting progressively worse. 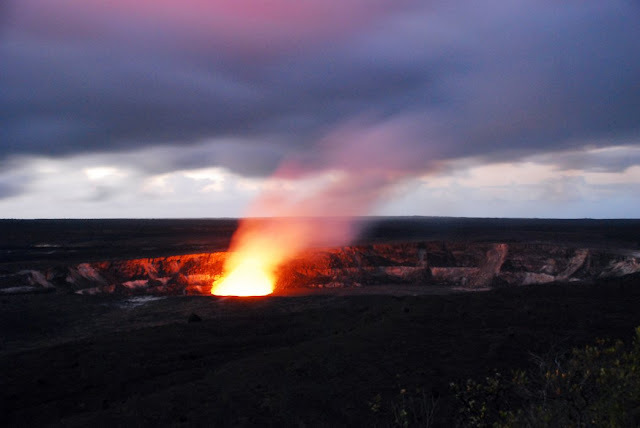 The third group was still at the summit when Kilauea exploded in the largest explosive eruption for many centuries. The third group left in haste. Soon they came across the second group, which appeared to be resting by the road, but when they came closer, they realized that every single member of the second group was dead. and volcanic ash from 1790 eruption. The first and third groups survived, but the middle group, at least 400 people, was hit by a pyroclastic surge: hurricane force winds of superheated steam, ash and suffocating gasses. Although the third group was closer to the explosion, the second group was in the path of the surge, simply in the wrong place at the wrong time. Soon rain fell on the layers of volcanic ash changing them into thick mud. It preserved the footprints of surviving ancient Hawaiians. Those footprints are still visible in Ka‘u desert. Keōua took the catastrophe for a divine sign. His district was covered in volcanic ash and hit by crop failure. He lost spirit and the willingness to fight. Next year he gave himself up and was executed, sacrificed in Pu‘ukoholā Heiau, a temple which Kamehameha just finished. I find these two stories of Dathan and Abiram on one hand and Keōua on the other hand surprisingly similar. Both stories clearly originate in some underlying natural disasters, most likely of a similar, volcanic nature. But there are also substantial and worrisome differences. And the Biblical tradition is not coming out of this comparison well. Keōua did not blame his second column for being despicable sinners deserving death. Keōua did not blame the victims, but took blame on himself. The Biblical tradition, on the other hand put the blame unequivocally on the victims - they deserved the harshest punishment. And as if it was not enough, postexilic textual editors used this ugly story for their own second temple ideological ends - political and religious propaganda. They added and mixed in another storyline about the Korihites and their priestly challenge to the Levites’ leadership. Thus centuries later they re-used the story for the setting of scores between two priestly groups of Korahites and Aaronites/Levites - just guess who were the Second Temple winners. This is for me the greatest nightmare, this is for me the greatest horror of this biblical story - transforming the LORD into a killing monster while blaming the victims; and the Bible does not only that, it takes it one step further, it uses a natural disaster and the tragedy of its original victims for self-serving political and ideological ends. As I have told you, if you want nightmares, read the Bible! But not everything is completely dark. By writing what I have just written, by reading what you have just read, by recognizing and acknowledging this problematic, nightmarish nature of some biblical passages we have taken the first steps towards healing. We are being liberated from the idolizing of the Bible; we set ourselves free from dangerous fundamentalism. Simultaneously we learn to recognize similar inhuman arguments in and among ourselves and in our society. Furthermore, we train ourselves to respond to disasters differently, not by finger-pointing and assigning the blame, but by reaching out with compassion and helping hands. Sometimes even nasty horror stories can have a real positive outcome. Two hundred thirty one years ago this Sunday, exactly on July 20, 1783 (which also happened to be a Sunday) the Reverend Jón Steingrímsson preached his famous sermon - Eldmessa - “The mass of fire.” Earlier that summer, on June 8th (which that year was Pentecost) the volcano Lakagígar (also known as Laki) erupted with ferocious force just north of his South-Icelandic home Kirkjubæjarklaustur. It was one of the largest known Icelandic eruptions. It produced 3.4 cubic miles of lava and changed the global climate for the next several years: for instance next winter the Mississippi River froze over at New Orleans and ice floated in the Gulf of Mexico. 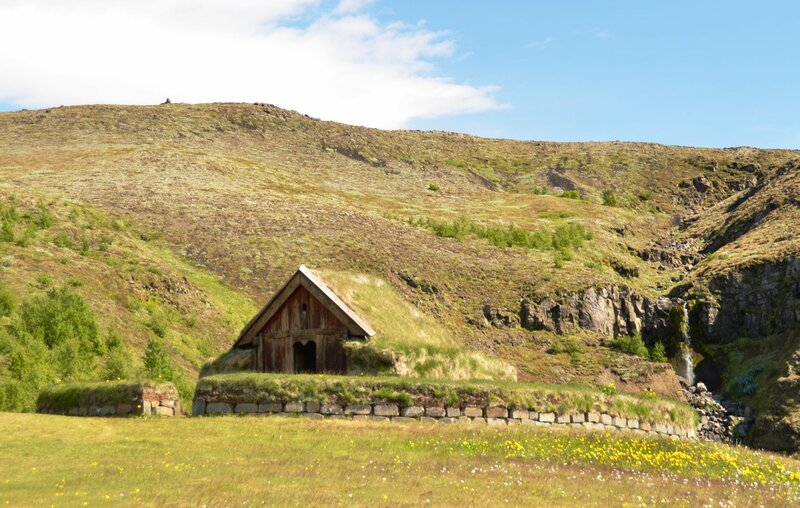 On Sunday July 20th a mighty lava flow was about to enter the Kirkjubæjarklaustur village and the church was likely the first to be swallowed. Everyone was ready to run but their minister coolheadedly insisted on keeping the last Sunday service before they left. 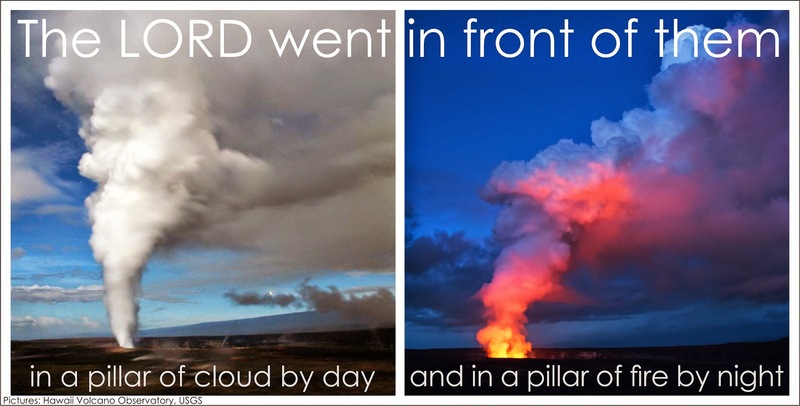 When they went to the service, they could see the lava flow creeping forward, but after the service, the lava stopped and never moved again. Their home village was spared! He used this disaster and miracle to build up community spirit and cohesion, thus preparing his parish for upcoming years of severe hardships, crop-failures, livestock demise and widespread famine. Disasters are unavoidable. They might be natural, they might be human-made, they might be human-complemented, but the important thing has always been how people chose to narratize and remember them. Disasters are by definition beyond our control, but we control the stories, we control what we say in those stories. Those stories are important, they have real impact in our world, they influence human behaviour, our reactions to disasters: for instance how prepared and willing we are to help. Thus these narratives have power to disclose a lot about our understanding of the world, about our understanding of God, about our society and about us. We will try to achieve just that as we continue looking at Volcanic Yahwism and more specifically the volcanic story of Dathan and Abiram (Datan and Aviram) from the Book of Numbers. South Icelandic sod chapel (not in Kirkjubæjarklaustur). 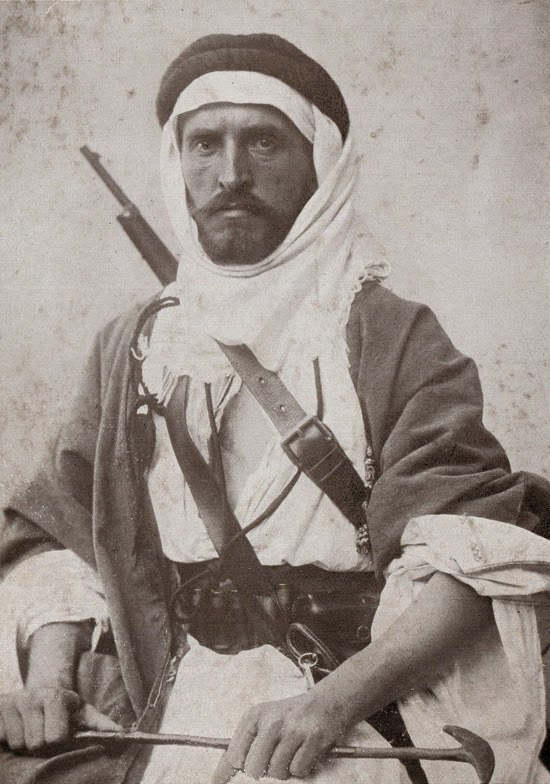 Meet “Alois of Arabia” - politically unsuccessful and today virtually unknown rival of Lawrence of Arabia. His full name and titles were the Rev. Prof. Dr. Alois Musil. Among Arabs he was also known as Musa ar Rueili. He was a Roman Catholic priest from Moravia, a professor of Hebrew and Old Testament studies in seminary, a published anthropologist, explorer and geographer of the Middle East. One hundred years ago the anthropologist and archeologist T.E.Lawrence was recruited by British Intelligence to instigate an anti-Ottoman rebellion among Arabs. Alois Musil was instructed by his country - the Austro-Hungarian Empire - to keep it from happening. We all know how it ended - Lawrence of Arabia was phenomenally successful in undermining the Ottoman Empire. It is less known, that after the Great War, Lawrence advised strongly against the Allied Powers carving and dividing the Near East into artificial colonies. One hundred years later and with all those original colonial borders on fire, we can appreciate his wisdom. And a century later Alois Musil is also being appreciated again, in this case for his interesting geographical and theological insight. With his theological as well as ethnographic and geographic knowledge, he located some pivotal Exodus stories not in the Sinai Peninsula, but he placed them in the volcanic fields of Northwest Arabia. Now, after a century in virtual obscurity, Musil’s (and other’s) old theories are being given a fresh look. I would still warn against using them to rationalize biblical miracles; I would still warn against an attempt to prove the historicity of biblical narratives. But these century old theories, together with modern volcanological knowledge can offer us new insights into the complex, eruptive, disruptive, truly geology-strong and above all Arabian (sic!) origins and nature of our Judeo-Christian Faith. This Sunday we will look for Volcanic Yahwism. Auspiciously it brings together my two big passions, theology and volcanology. A colossal column of cloud towered to a great height in the air immediately above the crater, and the outer swell of every one of its vast folds was dyed with a rich crimson luster, which was subdued to a pale rose tint in the depressions between. It glowed like a muffled torch and stretched upward to a dizzy height toward the zenith. I thought it just possible that its like had not been seen since the children of Israel wandered on their long march through the desert so many centuries ago over a path illuminated by the mysterious “pillar of fire.” And I was sure that I now had a vivid conception of what the majestic “pillar of fire” was like, which almost amounted to a revelation. I personally share Mark Twain's feelings of awe and reverence. 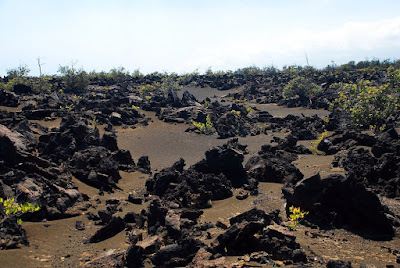 A similar, although smaller, lava lake has been present in the so-called Overlook Vent of Helema’uma’u Crater since Spring 2008 producing identical phenomena as documented on the pictures above or beneath. with some domesticated animals around. Summer is coming and with it comes an opportunity to get closer to nature even for us the arch-city-dwellers. It occurred to me that before summer it might be interesting to mention that according the Bible the LORD our God is an enthusiastic camper. You might remember that in biblical stories after the people of God escaped from Egypt they wandered in the wildernesses and deserts of the Middle East. God went and camped with them. God’s shrine was a large tent - sometimes called the Tent of meeting, other times the Tent of Testimony, or simply the Tabernacle. We are told that this tent was pitched in the center of the Israelite camp and represented a symbolic residence of God among them. On the way from Egypt, people camped and their God camped along with them. Soon after people settled down and built their permanent houses, God also moved into the permanent and representative dwelling in the Jerusalem temple (house of god). Thankfully there are many indications that God didn’t give up camping that easily. Firstly, according to the bible it took several generations after people built their own homes before they finally built the Temple. And secondly, even after the Temple was built, the Tent of Meeting didn’t simply disappear. The Tent keeps appearing in different biblical texts long after the temple was built. Some theologians think that God became seasonal camper, returning to dwell in the tent at least during some holidays. And this divine camping disposition did not disappear completely even in the New Testament times. In the first chapter of the Gospel of John we read the famous hymn about the Word which was coming to the World. And right there, in the apex of this beautiful hymn, we can read “And the Word became flesh and lived among us.” Do you know what? “Lived among us” literally translates as “pitched his tent among us”. all the earth inhabitants are just like grasshoppers. I told you - our God is an ardent camper. God took us along for this romantic and thrilling camping trip. We are guests in God’s tent. How are we doing? How do we behave in God’s tent of this world? It was a hot, muggy July afternoon in New York City. I was on my way to a pastoral visit, carrying a heavy bouquet of white roses. I love all such occasions, but this one was really special. Not often does one have a privilege of bringing best wishes to a member who was 102 years old. For many of you who knew him, I went to see Scott Morton. It happened 3 years ago. Scott died the next Spring, but I still remember the visit as if it was yesterday because at the end of a nice visit, I received a very unique gift I still treasure. My dear and respected friend and colleague Scott gave me his blessing. I went to him to serve and to give and I was the one served and receiving. It was a deeply meaningful, moving and spiritually transforming experience. Some simple words and some quiet moments indeed have special power! Anthropologists and philosophers of language call such events “performative utterances”. It is unfortunate that secular scholars have better understanding of this reality than theologians or people of faith. 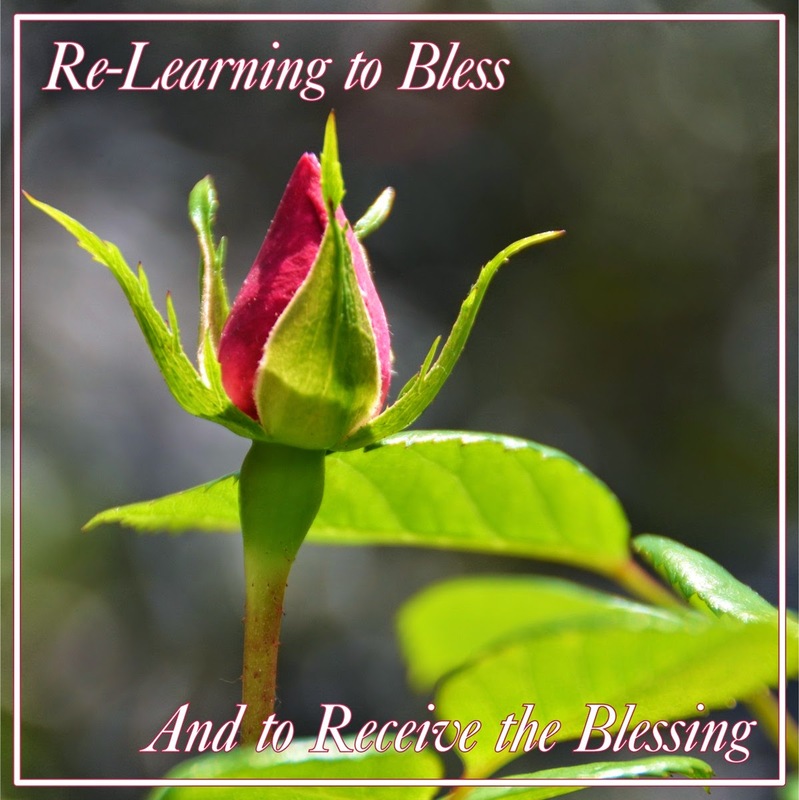 Come this Sunday as we seek to re-learn receptiveness for blessing, for these subtle yet powerful words and moments. Join us as we seek to return their meaning and gravity to our lives. This picture shows a part of the silver amulet scroll no.2 from a tomb in Ketef Hinnom (a ridge located just south of ancient Jerusalem). 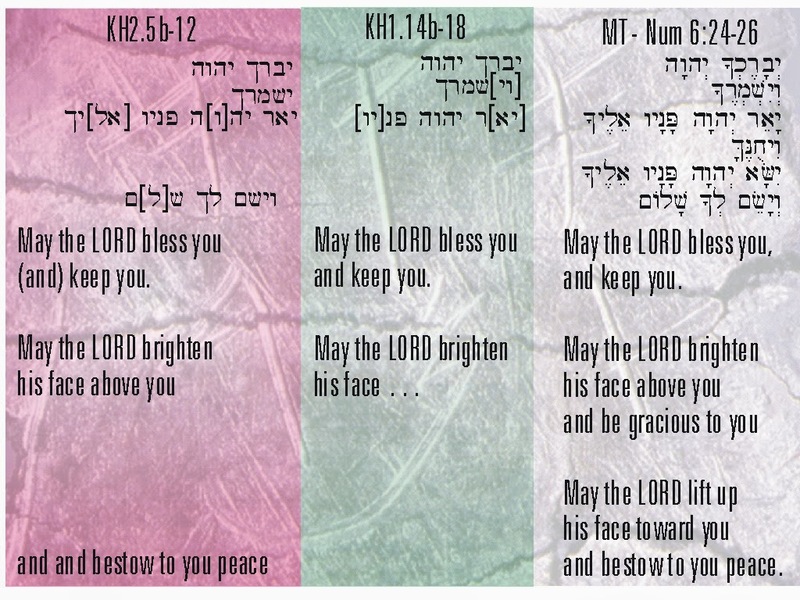 It dates from the 6th century BCE and contains the oldest preserved version of the so-called Aaronic or Priestly Blessing (which would later be recorded in Numbers 6:24-26 and in our modern, gender-inclusive translation reads - The LORD bless you and keep you,The LORD smile on you and be gracious to you. The LORD shower you with favor and give you peace.). What looks almost like some random scratches on the foil are actually ancient letters (in the Paleo-Hebrew Script) and this particular section can be read: "The LORD bless you (and) keep you..."
Location of the find - in a depository cave under the chamber 25 of the cave. 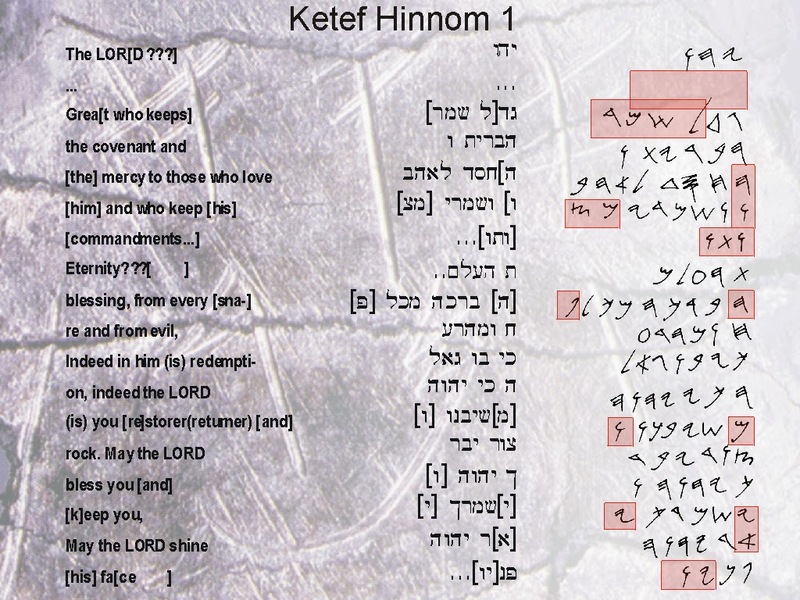 Ketef Hinnom scroll number one (larger scroll) - columns from right to left - Redrawing of Paleo-Hebrew script, transliteration into modern Hebrew square script, and tentative translation. 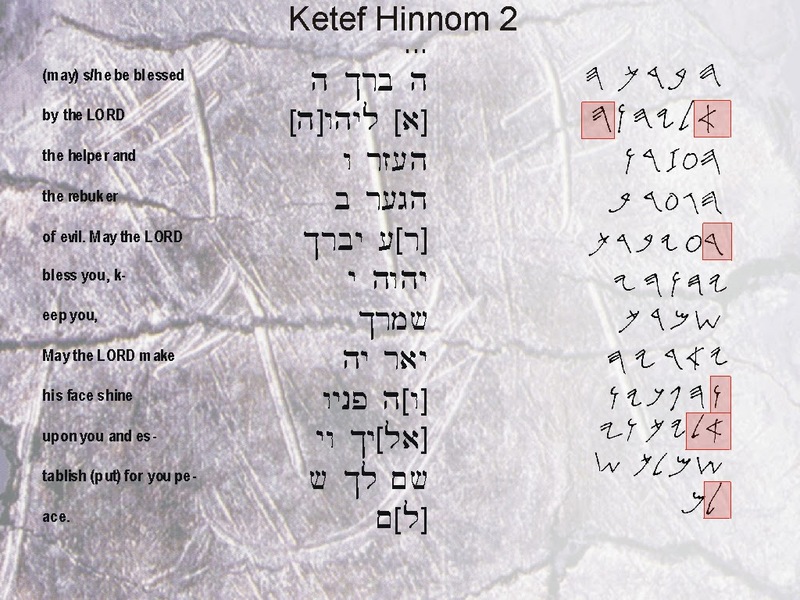 Opening part of the text KH 1 paralleled with two similar biblical passages in Hebrew and in translation. 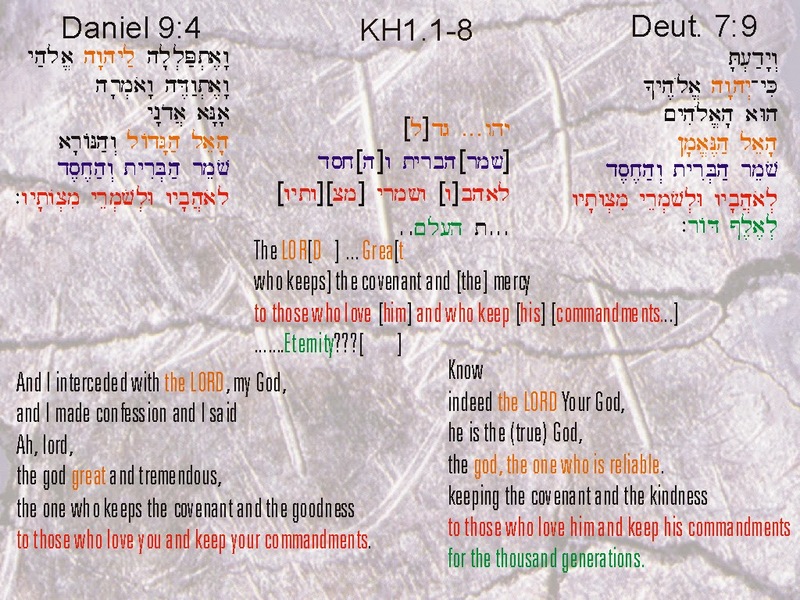 The "Blessing part" of both scrolls compared with the Aaronic Blessing from the Masoretic Text of Numbers 6. Similarly close text which could not be direct quotation from a written text but was a product of a shared oral tradition. 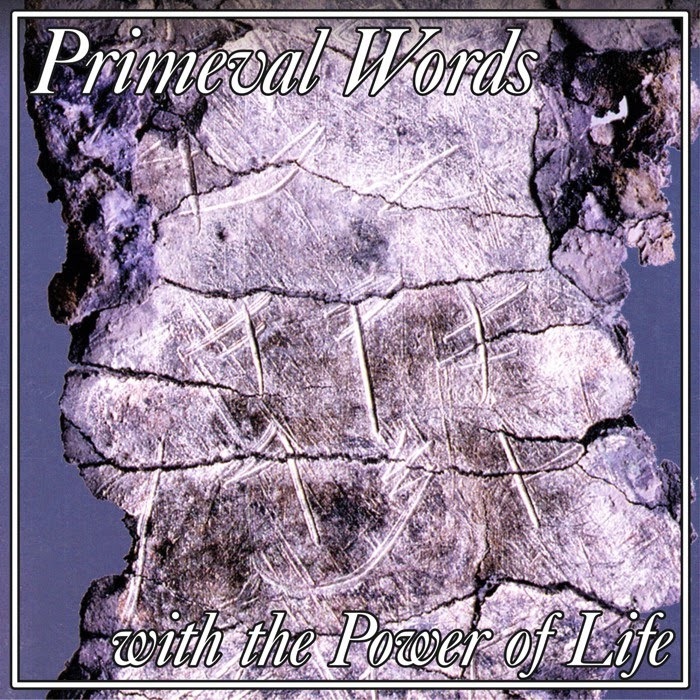 The Ugaritic text dates from the end of XIII. 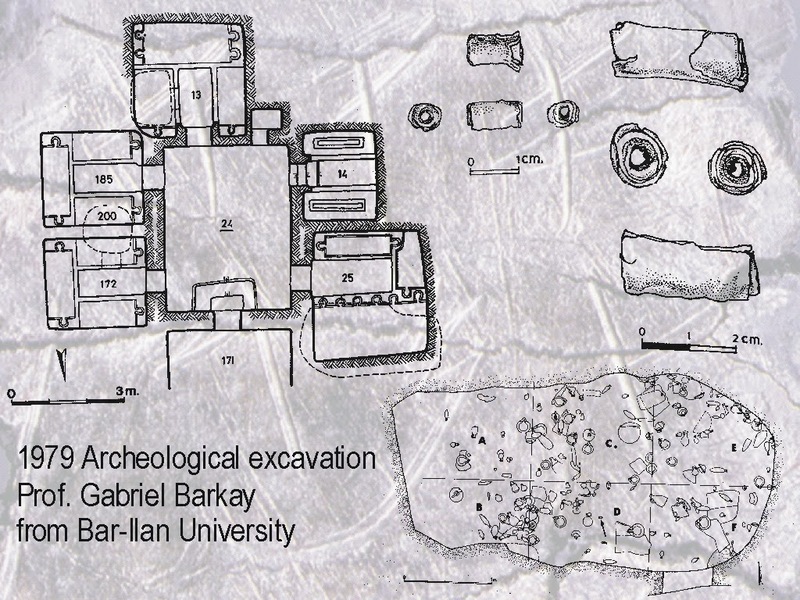 century BCE while Isaiah text is several centuries younger and without any direct access to the texts from Ugarit. 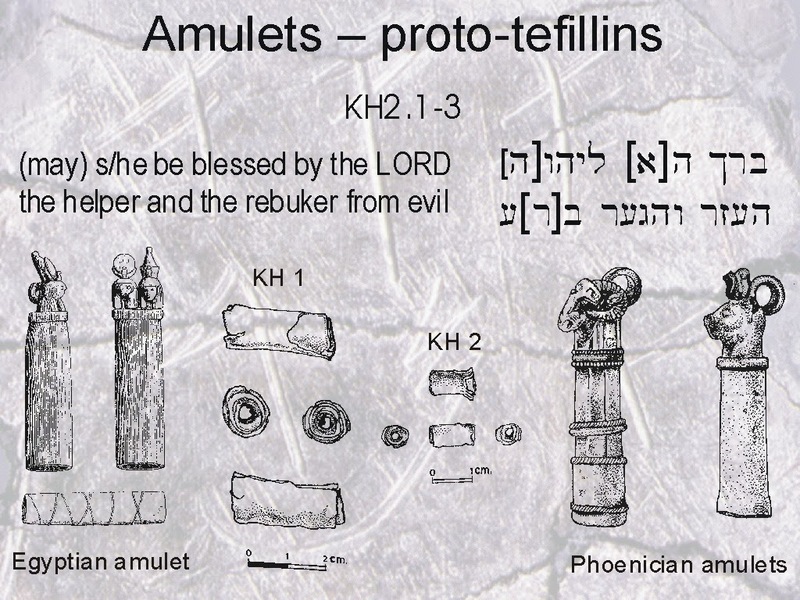 Ketef Hinnom scrolls were apotropaic personalized amulets which were well distributed throughout the Ancient Near East. 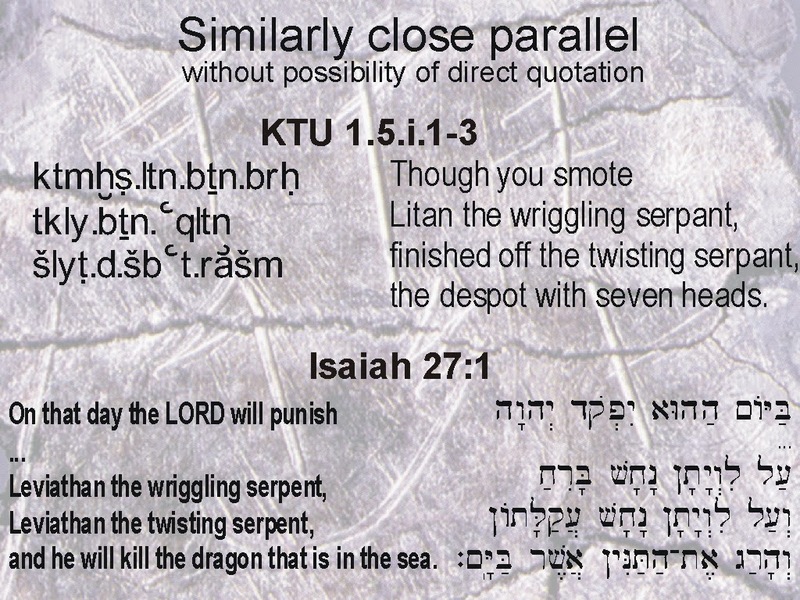 The text of the scrolls does not prove existence of the written text of the Torah (the Pentateuch - Five Books of Moses) it only documents popularity and apotropaic (magically-protective) use of this particular blessing which would later be recorded in more full form in Numbers 6 as Aaronic or Priestly Blessing.